HITEC University Taxila is famous university in Pakistan that is providing quality education to the students of Pakistan. HITEC is private university located in Taxila that is famous for weapon industry of Pakistan. HITEC university Admissions 2019 are now open for undergraduate, graduate, postgraduate and PhD programs. Thousands of students apply online HITEC university taxila to get higher education in this institute. Taxila is about 30 KM north west area of Islamabad & Rawalpindi. HITEC University Taxila admission 2019 complete information & procedure to submit admission form is here. webstudy.pk is right place where you can info about hitec taxila university admission fall 2019 form download 2019. University also offers scholarships for students who really deserve that. 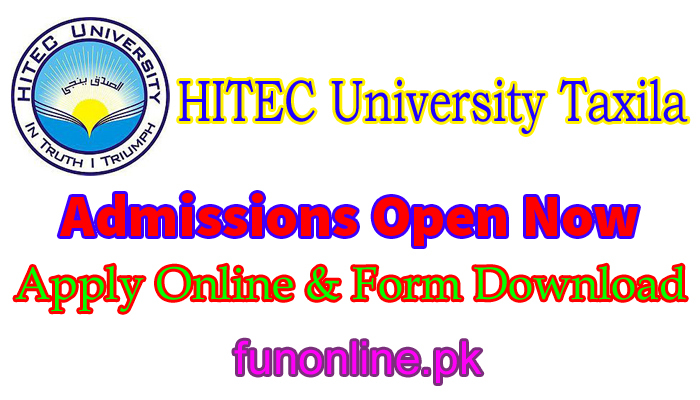 Here you can also get more details about HITEC university taxila admission 2019 merit list download. HITEC University was established in 2007 with 250 students but now it becomes famous university of Pakistan with modern facilities. Heavy Weapon Industry Paxila Education Welfare Trust (HITEWT) sponser this university to improve. HITEC University was granted charter by government in 2009. HITEC Admission fall 2019 complete details and how to apply online details are here. Every year thousands of students apply for HITEC university taxila but only some lucky ones get the admission in university. Hitec university taxila programs offered list is also here below. University Of HITEC Taxila provide basic facilities like air conditioned classrooms, Clean environment, beautiful lab, library & lecture theater halls, play grounds, canteen, well trained staff and educated faculty. HITEC University Taxila admission fall 2019 Last date is 31 july 2019 and entry test will be on 04 august 2019. University Of HITEC admission 2019 details like transportation, pick and drop points list, hostel, gym & swimming pool are available in university campus. Note that result awaiting students also can apply but with hope certificate. HITEC University timing is 08:30 to 3:30 PM. HITEC University Taxila scholarships are also available for first 50 students on merit list 2019 but only for 1st semester. Liberal financial assistance scholarship for needy and excellent students. University Timing: 08:30 AM to 03:30 PM. Admission in MS will be on the basis of GAT-NTS general with 50% marks minimum. GAT subject test by NTS with minimum 60% cumulative score or GRE subject test with 60% marks. At webstudy.pk HITEC university admission 2019 last date, Admission form download, Entry test Date, Entry Test result 2019, eligibility critera and classes date is available after entry test and merit list HITEC university taxila. the University HITEC taxila offers Master, Bachelor & Doctoral level programs in Mechanical & Electrical Engineering along with the Bachelor in Islamic Studies, Business Administration and Master in Business Administration and Mathematics. Please register with your valid Email as your User ID. Password will be sent at your email. The email address will be subsequently used for activation of candidate’s account and further communication. After registration, you can login again any time to complete your application form. Your Email will help you to retrieve your password (in case you forget your password). Upload candidate photograph with blue background (300KB or less in size). The face of the candidate should be clearly visible in photograph. Valid and scheduled NAT/HAT tests conducted by NTS and HEC respectively will only be accepted and considered in merit calculation. Hard copy of the result (HSSC Part I or II) submitted with the application form will only be accepted and considered in merit calculation. Clicking “Submit” button of the filled up form will display the Application Form and a Challan Slip. Print the Application Form and the Challan Slip. Attach Documents as per check list. Candidates can also send bank draft for @ Rs. 2,000/- in favour of HITEC University Taxila, instead of Bank Challan. By cleraly writing the name of candidate , CNIC Number and Chalan Number at back of bank draft. Send the printed Application Form with Original Challan Slip (University Copy) and academic documents as per checklist to: Registrar, HITEC University Taxila Cantt by courier or registered mail or by hand to reach HITEC University Taxila before last date. HITEC University will not be responsible for late receiving or loss of the Application Form or the Challan Slip. Note that all the information about HITEC Fall admission 2019 is collected from different sources on internet but for authentic news and updates regarding HITEC admissions fall 2019 visit university campus. HITEC university Taxila fall admission 2019 merit list result, hitec university taxila fall admission 2019 details are here. webstudy.pk also provide jobs in HITEC University Taxila.